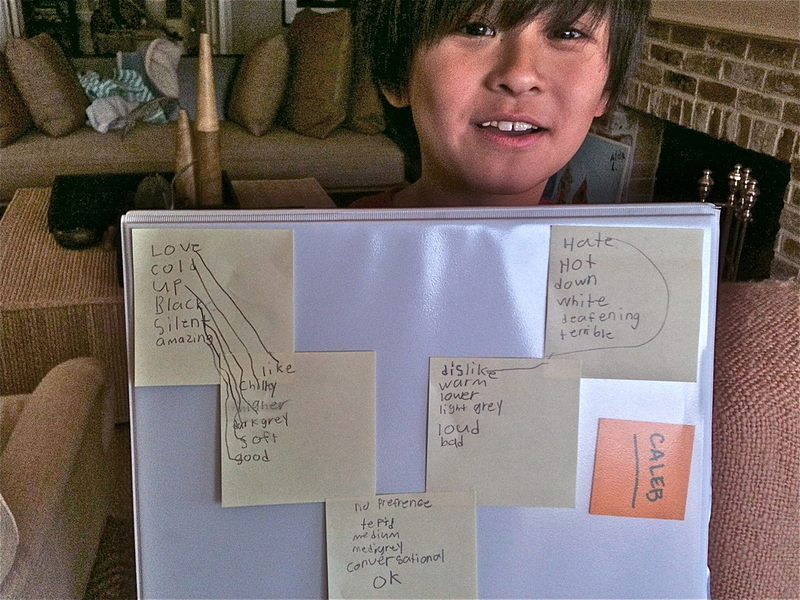 Caleb and his lists of words. My request for a little louder was causing an immediate crescendo to FFFFF. A suggestion to play "softer" was making his playing inaudible. "Let's make a list of strong words with their opposites," I suggested. We wrote each set on a post-it note and put it on his assignment book. Love/Hate, Cold/Hot, Up/Down, Black/White, Silent/Deafening, Amazing/Terrible. "How 'bout some less strong versions?" I asked. Like/Dislike, Chilly/Warm, Higher/Lower, Dark Grey/Light Grey, Soft/Loud, Good/Bad. What about something in between all of them? No preference, tepid, medium, medium grey, conversational, OK. Suddenly, I found myself with a great resource. "Caleb," I said. "Did you know that when I ask you for a little louder than silent, you go straight to DEAFENING!" "Oh," he said. "I get it. You mean that I should go to soft, or maybe medium?" We're leaving those post-its on the assignment book for a long time.